Back to work and wow does it feel good! Not only is my computer an almost literal dream machine, after getting through some of my past struggles it has been so refreshing to be back full time doing what I love. Yesterday was a very chilly day here in NW PA. It felt like a gorgeous fall day … oh how I love fall! This foxy fox figurine was a tutorial that was sent to Parker’s Clayful Tutorial Club Members this past week. CLICK HERE to get the tutorial for yourself. My lovely assistant, Mocha Latte, is eager to learn all about polymer clay and can easily reach the counter at this point. This week I restocked my polymer clay box … then I spent several hours late into the night claying away. There are few things in polymer that can make me work into the wee hours of the morning anymore … except a fresh clay box. Still trying to get fully caught up, week 32 of the #2015PCChallenge brought Razzi to life in the Magical Forest. Read about her here. Adopt her here. I’m a list maker, but I never used to be until I got married. Now I’m an avid list maker. I found an awesome little outlet for my compulsive need to make lists, it’s called #ListersGottaList from TheResetGirl, check it out here. 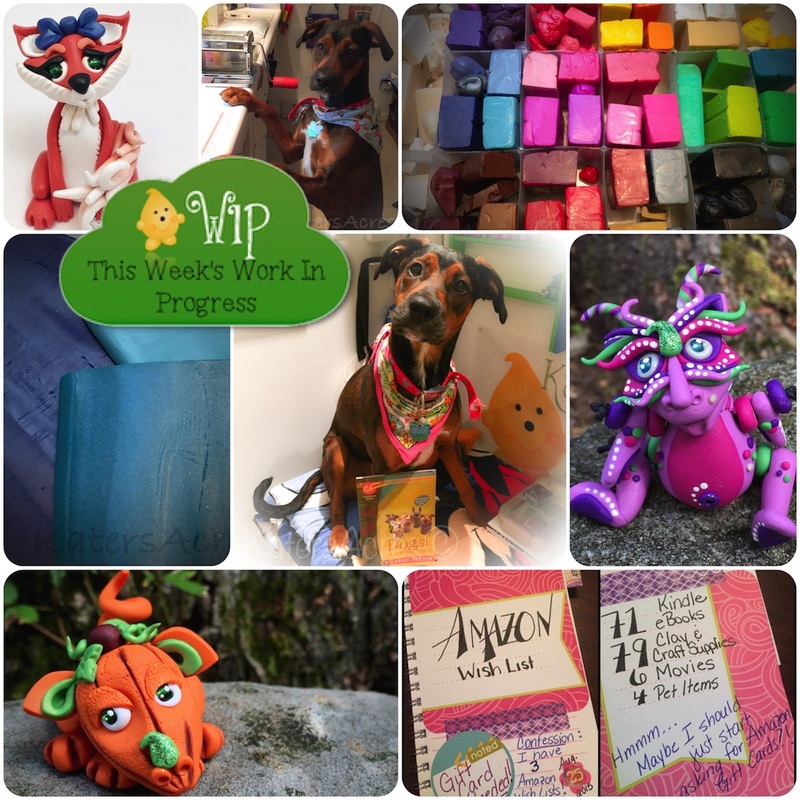 Week 33 of the #2015PCChallenge brought another new dragon addition … Pup the baby pumpkin dragon. You can read about him here and adopt him here. This lovely deep blue color palette is a rare glimpse at 3 Premo! polymer clay colors straight from their packs. Come & get the newest free polymer clay color recipe Metallic Ocean Blue. Last, but not least … Mocha Latte posed with the newest Christi Friesen book, Dragons, the revised edition. You can get your copy here. Ginger Davis Allman from The Blue Bottle Tree is teaching her first workshop “Conquering Translucents” in Dallas, Texas on October 10-11. Check out the details here. Syndee Holt always share amazing color explorations every Tuesday on the Polyform website, this month she’s explored the new Opal clay. Here’s her most recent color recipes. Be sure to check them out. The classes at the Polymer Clay Adventure for 2015 have been top notch, you will NOT want to miss these! 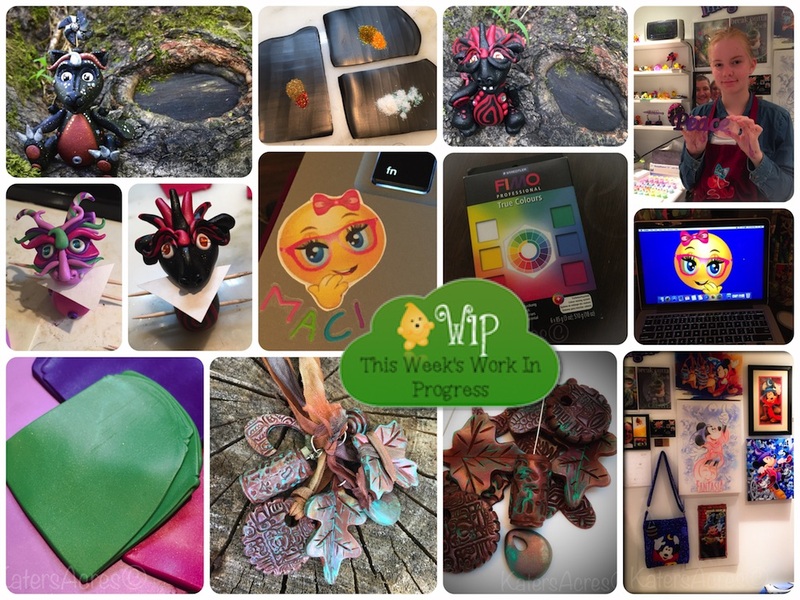 Don’t miss some of the gorgeous polymer work that has been popping up. I share all my favorites here on FaceBook. My hubby took me out for dinner & we spent an entire evening at the lake this past week. You’ll never guess what I found while picking up rocks … A Parker shaped rock (see picture at left). I spent half a day and went shopping with my Mom & German cousin Dörte. I didn’t buy much, but you better believe I made some coffee for the trip & packed my sunglasses too! I’ve been taking some computer classes again to help me learn a few new things for KatersAcres. I love learning so much, it always feels so good to accomplish something new. I’m completely addicted to making my own stickers for my planner (and my lists too) and have bought the cutest new clip art graphics from PrettyGrafikDesigns on Etsy. Be sure to check her out. I’m almost completely caught up from my one month hiatus … that’s a great feeling to have!